Following closely upon the release of the new iPad Air and iPad mini, Apple’s latest iWork update brings the productivity suite’s iOS apps closer to parity with their Mac siblings. Is it possible yet to import style sheets into a Pages document (e.g. from another Pages document)? This is probably the last main feature that was lost in 2013 that still causes me grief. No, it doesn’t. It’s not a trivial thing to provide, as Pages documents have several types of styles: paragraph styles, character styles, and list styles. A style import mechanism would have to give the user options to import each separately and to handle those cases where imported styles of each type conflict with the ones already in a document. Nonetheless, if you haven’t sent Apple feedback requesting style imports (or even if you have previously), you should. The more people who request a feature, the more likely it is that Apple will implement it. I gave up on iWork when they monkeyed with it so much it became useless. Especially with Pages, which I had used all the time. I can’t even make changes to several text items at one time, which I used to do all the time. Say I wanted to make a font change to several paragraphs separated by another paragraph, used to just hold down the command key as I selected the two paragraphs and made the change. Now have to do each one individually - a waste of time and effort. It was that sort of ignoring the consumer’s needs that drove me to my now beloved Nisus Writer Pro. I now use pages mainly when I am developing agendas or Harvard outline planning notes. Or when i am at a meeting using my iPad - the notes of which are immediately imported into a Nisus document when I get home. Oh how I wish Nisus had a iOS app!! More, I wish Apple put back all the things they took of iWork apps. Thanks for the informative article. I have not yet upgraded my Mac from Sierra but have not had any problems using Pages latest version with my iPad Pro and the Mac thank heavens. Thanks, Michael, that’s extremely useful. I’ve used Copy Style/Paste Style before, but only to apply font/formatting to some text – I never realised that (in Pages) it would copy the actual style sheet, and merge it if it has the same name as an existing one. Being able to copy and paste the actual style sheets goes some way to make up for the lack of import style functionality. It would be a bit tedious if updating a set of related templates with new styles, but for my current purposes, this is all I need. 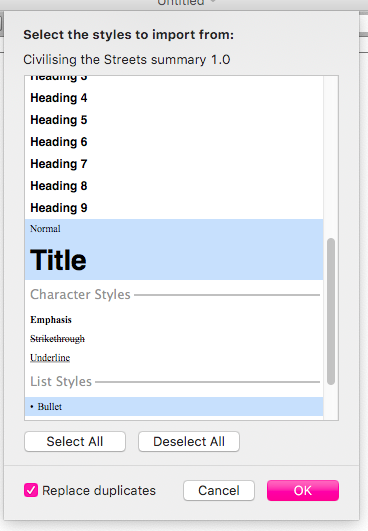 It’s not a trivial thing to provide, as Pages documents have several types of styles: paragraph styles, character styles, and list styles. A style import mechanism would have to give the user options to import each separately and to handle those cases where imported styles of each type conflict with the ones already in a document. I did send feedback to Apple years ago when the new Pages was first released, but haven’t since then. I might just see how I get on with the copy/paste styles for now. At the moment I’m not writing the kinds of documents I used to which often benefited from being able to import a whole set of styles in one go. Is using the older iWork apps still a thing for some people? I remember you could have the new and old versions on your machine at the same time (by manually choosing to keep them), and sometimes be able to slip between them to use the ‘old’ functionalities not found in their newer counterparts. Yes, it is still a thing. I have both the current Pages and the old one on my Mac, and they co-exist reasonably well. That said, I can’t remember the last time I needed to use the old app other than to check things out for my Take Control of Pages book. I also still have the old apps installed. However, it’s a sign of how much the new versions have matured that I haven’t run them in months and months (whereas for years after the new ones came out, I continued to primarily use the old versions of Pages and Numbers). Good thing, too. When I opened Pages for the first time in months to take the screenshot above, I got the warning that it isn’t ‘optimised’. So I guess the old iWork is 32-bit and will stop working later this year in Mac OS 10.15.